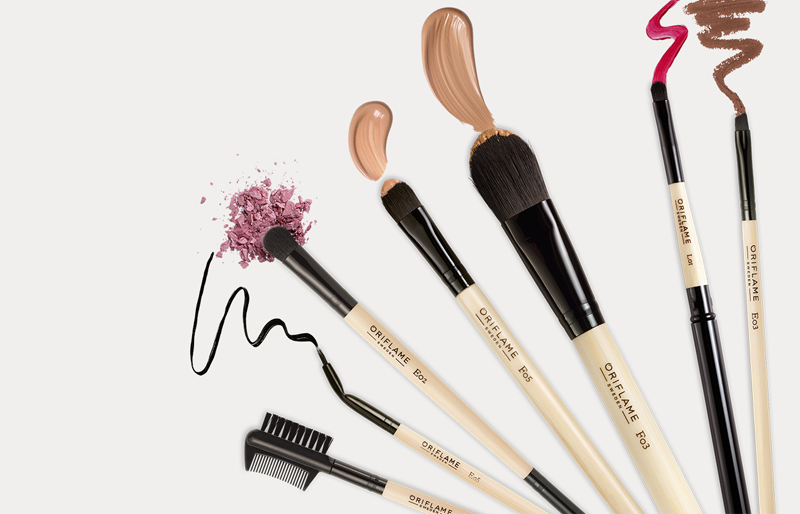 Not all brushes are the same, so you’ll find 8 precision brushes in Oriflame’s exclusive range of make – up accessories . Each brush is designed for a specific need for you to have full control and master every detail and enjoy trendy, discreet or impactful looks. packages Each brush is shipped in a clearly marked, individually sealed package that is carefully heat-sealed. This is a hygienic and tamper-proof solution that ensures that you always receive your brushes in perfect condition and ready to use. nylon bristles are an important feature in all our make-up brushes – an excellent choice when compared to natural bristles, for being cruelty free . In addition, they are incredibly soft on the skin, easier to clean and do not lose bristles so easily, so they give more durability and maintain the shape for longer. Opting for sustainable beauty products benefits everyone. That’s why, integrated into our commitment to you and the environment, all the cables in our new brushes are made of bamboo – a renewable, fast-growing plant. Flat brush “cat tongue” for base application. What it does – flat and conical format allows for a controlled, fast and uniform application of liquid and cream color bases. Professional application – always start by applying the color base to the center of the face and work it to the ends (hair and neck). In this way, it prevents the accumulation of product at the ends of the face. Brush Flat, curved tip flat brush developed for a uniform application of all base types. Materials: Nylon bristles, aluminum, bamboo. Length: 16.5 cm. Diameter 1,3 cm. Large brush, with soft bristles, for powder application. What it does – easily grabs the powder and ensures a perfectly uniform application and a smooth finish. Its special bristles retain the powder and make the brush less dense, resulting in a fuller brush and better results. Perfect for loose and compact powder. Professional application – apply powder with circular and uniform movements. You will be surprised by the result. Brush Bulky and round brush for powder application in larger areas. Perfect for loose and compact powder. Materials: Nylon bristles, aluminum, bamboo. Length: 18 cm. Diameter 1,5 cm. Flat brush “cat tongue” for broker application. What it does – The thin, tapered end of this brush makes it perfect for easy and precise coverage of dark circles, eye corners, eyelid or nose sides. Its compact shape allows for fantastic control. Ideal for quick retouching during the day. Professional application – for perfect coverage, apply broker points under the eyes and squat. A fine and sharp brush to apply corrector in the contour of eyes and nose. Materials: Nylon bristles, aluminum, bamboo. Length: 15.2 cm. Diameter 0.9 cm. 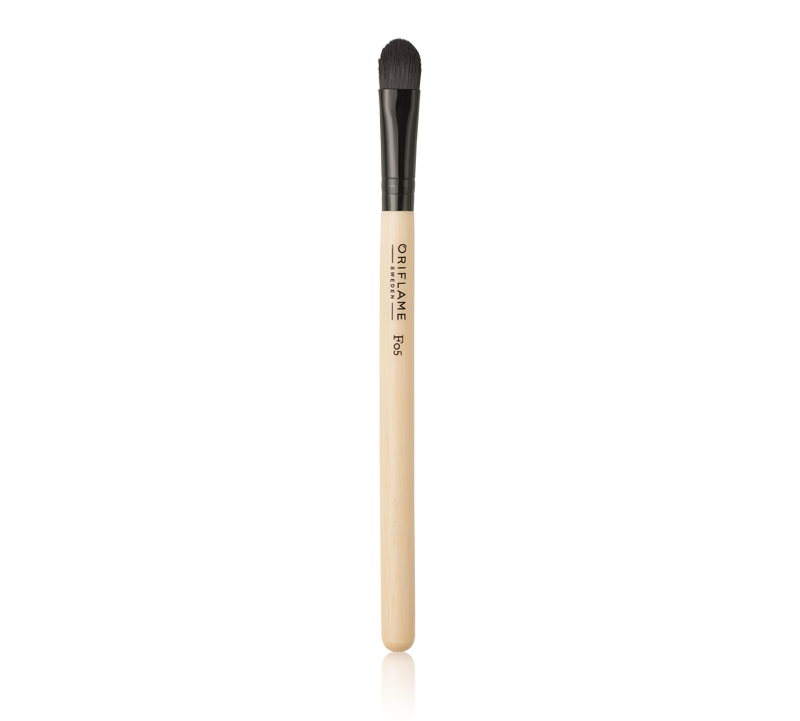 Soft and beveled brush for blush application. What it does – Its bevelled shape allows the bristles to easily pick up the powder and ensure a uniform and natural application of the powder. An essential accessory to blur and contour the cheekbones in order to achieve a more defined and sculpted look. Professional application – smile to highlight the cheekbones, apply the blush to the center of the cheekbones and gently bang, with circular and upward motions. A bevelled blush brush, easy to apply and dust-free, to create a perfectly defined look. Materials: Nylon bristles, aluminum, bamboo. Length: 17 cm. Diameter 1,3 cm. Double design – one side with eye shadow brush and other side with sponge. What it does – the perfect duo for the application of any type of shadows. Its compact size and rounded shape provides precise application in all areas of the eye and uniform color finish. The sponge tip allows a more precise and intense application of the color – perfect for delineating and fading, as well as applying product to the inner corner of the eyes. Professional application – use the brush tip to set the concave or apply illuminator under the eyebrows. 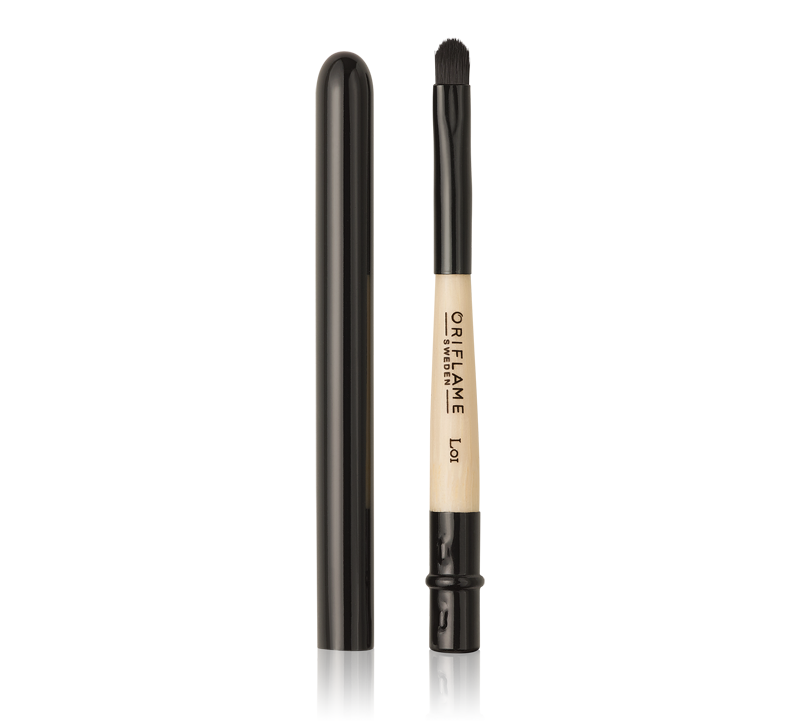 Use the sponge tip to fade eyeliner – great for those who do not have a steady hand! Brush Precision A double eye shadow brush, ideal for applying and fading any type of eye shadow. It has compact brush and round of one side and sponge of the other side. Includes replacement sponge. Materials: Nylon bristles, aluminum, bamboo, PU foam. Length: 17.5 cm. Diameter 0.9 cm. Smooth, dense tapered brush to fade away. What it does – with soft bristles and filled to catch the eye shadow and blur it for perfect transitions, as well as set the concave. Created for a perfect eye contour and fade the color in the concave. Professional application – always use this brush as the last step in the application of eye shadows. Press gently for the bristles to open, and thus fade the colors for a smooth transition, without leaving any strong lines. A paintbrush created specifically to fade. Ideal for use with eye makeup to create smooth transitions. Materials: Nylon bristles, aluminum, bamboo. Length: 16.7 cm. Diameter 0.9 cm. Brush / comb for eyelashes and eyebrows. Professional application – after applying the eyelash mask, Lashes from root to tip. Apply the color on the eyebrows with the brush or use it to blur the color of the eyeliner. Brush Features a brush to comb the eyebrows and blur the color of your eyebrows, and a fine comb to remove clumps of eyelashes. Materials: Nylon bristles, aluminum, bamboo, ABS. Length: 13 cm. Diameter 0.7 cm. Brush for lips, in a practical format, with lid. What it does – Thin, dense, small brush, perfectly developed to define the lip contour and apply lipsticks with more intense tones evenly on the lips. Professional application – for lips with bulky appearance, apply a lighter color to lighten the center of the lips. Take the brush and lipstick in the bag to do the touch ups throughout the day. Lipstick Small, dense and tapered lipstick to apply the color to the lips. Perfect design to carry in the suitcase with lid. Materials: Nylon bristles, aluminum, bamboo. Open length: 18 cm. Diameter 0.6 cm. Closed length: 10.4 cm. Cleaning your brushes is a must if you want to protect them and ensure they maintain excellent condition. We recommend deep cleaning regularly. Brushes for cream and liquid products (eg base and brush) should be cleaned more often. 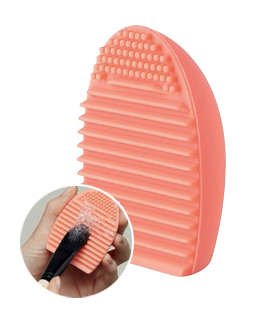 A silicone brush that effectively cleans all types of brushes while maintaining their quality for longer. Includes instruction booklet. Dimensions: 7.3 x 5.4 x 3 cm.